Argininosuccinate (ASA) lyase deficiency results in defective cleavage of ASA. This leads to an accumulation of ASA in cells and an excessive excretion of ASA in urine. In virtually all respects, this disorder shares the characteristics of other urea cycle defects. The most important characteristic of ASA lyase deficiency is its propensity to cause hyperammonemia in affected individuals. See the image below. 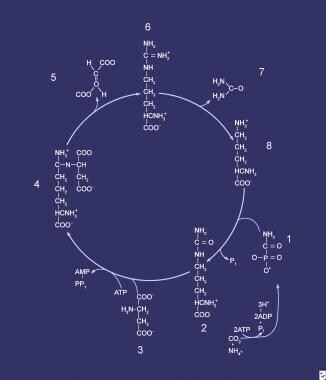 Compounds comprising the urea cycle are numbered sequentially, beginning with carbamyl phosphate (1). At this step, the first waste nitrogen is incorporated into the cycle; at this step, N-acetylglutamate exerts its regulatory control on the mediating enzyme, carbamyl phosphate synthetase (CPS). Compound 2 is citrulline, the product of condensation between carbamyl phosphate (1) and ornithine (8); the mediating enzyme is ornithine transcarbamylase. Compound 3 is aspartic acid, which is combined with citrulline to form argininosuccinic acid (ASA) (4); the reaction is mediated by ASA synthetase. Compound 5 is fumaric acid generated in the reaction that converts ASA to arginine (6), which is mediated by ASA lyase. The hepatic urea cycle is the major route for waste nitrogen disposal; nitrogen generation results chiefly from protein and amino acid metabolism. Low-level synthesis of certain cycle intermediates in extrahepatic tissues makes a small contribution to waste nitrogen disposal. A portion of the cycle is mitochondrial in nature; mitochondrial dysfunction may impair urea production and may result in hyperammonemia. Overall, the cycle’s activity is regulated by the rate of synthesis of N -acetylglutamate, the enzyme activator that initiates incorporation of ammonia into the cycle. A potential alternative is that the inability to release arginine from ASA leads to arginine deficiency, in turn restricting both protein and nitric oxide synthesis, the latter exposing tissues to damage from oxide radical damage. Whether ASA itself causes a degree of toxicity due to hepatocellular accumulation is unknown; such an effect could help explain hyperammonemia development in affected individuals. Regardless, the name of the disease is derived from the rapid clearance of ASA in urine, although elevated levels of ASA can be found in plasma. Hyperammonemia in this disease manifests with the typical findings and carries all of the attendant consequences associated with other urea cycle diseases. ASA lyase deficiency is associated with high mortality and morbidity rates. Failure to suspect hyperammonemia and to obtain blood ammonia levels results in certain morbidity and, likely, death because routine laboratory test findings are unrevealing. Inherited as an autosomal recessive trait, argininosuccinic aciduria affects both sexes equally. Although intellectual impairment is the rule, even among patients who receive excellent and timely treatment, some patients with ASA lyase deficiency reportedly develop normally. Advise parents of an affected infant that they are obligate heterozygotes because the disease is inherited as an autosomal recessive trait. This trait leads to a recurrence risk of 1:4 (25%) with each subsequent pregnancy. Prenatal diagnosis is available for ASA lyase deficiency, although the involved diagnostic procedures are not trivial. Even in cases in which elective abortion is not an option, parents should be prepared for an affected infant in order to avoid early hyperammonemia. Advise parents to scrupulously follow the dietary and medication instructions and to seek early medical attention for all intercurrent illnesses. Mitchell S, Ellingson C, Coyne T, et al. Genetic variation in the urea cycle: a model resource for investigating key candidate genes for common diseases. Hum Mutat. 2009 Jan. 30(1):56-60. [Medline]. Nagamani SC, Erez A, Lee B. Argininosuccinate lyase deficiency. Genet Med. 2012 Jan 5. [Medline]. Erez A, Nagamani SC, Lee B. Argininosuccinate lyase deficiency-argininosuccinic aciduria and beyond. Am J Med Genet C Semin Med Genet. 2011 Feb 15. 157(1):45-53. [Medline]. [Full Text]. Erez A, Nagamani SC, Shchelochkov OA, Premkumar MH, Campeau PM, Chen Y, et al. Requirement of argininosuccinate lyase for systemic nitric oxide production. Nat Med. 2011 Nov 13. 17(12):1619-26. [Medline]. Summar ML, Koelker S, Freedenberg D, et al. The incidence of urea cycle disorders. Mol Genet Metab. September-October 2013. 110:179-180. [Medline]. Mercimek-Mahmutoglu S, Moeslinger D, Häberle J, Engel K, Herle M, Strobl MW, et al. Long-term outcome of patients with argininosuccinate lyase deficiency diagnosed by newborn screening in Austria. Mol Genet Metab. 2010 May. 100(1):24-8. [Medline]. Falik-Zaccai TC, Kfir N, Frenkel P, et al. Population screening in a Druze community: the challenge and the reward. Genet Med. 2008 Dec. 10(12):903-9. [Medline]. Keskinen P, Siitonen A, Salo M. Hereditary urea cycle diseases in Finland. Acta Paediatr. 2008 Oct. 97(10):1412-9. [Medline]. Zimmermann A, Bachmann C, Baumgartner R. Severe liver fibrosis in argininosuccinic aciduria. Arch Pathol Lab Med. 1986. 110:136-140. [Medline]. Ficicioglu C, Mandell R, Shih VE. Argininosuccinate lyase deficiency: longterm outcome of 13 patients detected by newborn screening. Mol Genet Med. Novemeber 2009. 98:273-277. [Medline]. Diaz GA, Krivitzky LS, Mokhtarani M, Rhead W, Bartley J, Feigenbaum A, et al. Ammonia control and neurocognitive outcome among urea cycle disorder patients treated with glycerol phenylbutyrate. Hepatology. 2012 Sep 7. [Medline]. [Full Text]. Smith W, Diaz GA, Lichter-Konecki U, Berry SA, Harding CO, McCandless SE, et al. Ammonia Control in Children Ages 2 Months through 5 Years with Urea Cycle Disorders: Comparison of Sodium Phenylbutyrate and Glycerol Phenylbutyrate. J Pediatr. 2013 Jan 13. [Medline]. Berry GT, Steiner RD. Long-term management of patients with urea cycle disorders. J Pediatr. 2001 Jan. 138(1 Suppl):S56-60; discussion S60-1. [Medline]. Brosnan ME, Brosnan JT. Orotic acid excretion and arginine metabolism. J Nutr. 2007 Jun. 137(6 Suppl 2):1656S-1661S. [Medline]. Brusilow SW, Batshaw ML. Arginine therapy of argininosuccinase deficiency. Lancet. 1979 Jan 20. 1(8108):124-7. [Medline]. Collins FS, Summer GK, Schwartz RP. Neonatal argininosuccinic aciduria-survival after early diagnosis and dietary management. J Pediatr. 1980 Mar. 96(3 Pt 1):429-31. [Medline]. Glick NR, Snodgrass PJ, Schafer IA. Neonatal argininosuccinic aciduria with normal brain and kidney but absent liver argininosuccinate lyase activity. Am J Hum Genet. 1976 Jan. 28(01):22-30. [Medline]. Kleijer WJ, Garritsen VH, van der Sterre ML, et al. Prenatal diagnosis of citrullinemia and argininosuccinic aciduria: evidence for a transmission ratio distortion in citrullinemia. Prenatal Diagnosis. 2006 Mar. 26(3):242-7. [Medline]. Linnebank M, Tschiedel E, Haberle J, et al. Argininosuccinate lyase (ASL) deficiency: mutation analysis in 27 patients and a completed structure of the human ASL gene. Hum Genet. 2002 Oct. 111(4-5):350-9. [Medline]. Reid Sutton V, Pan Y, Davis EC, Craigen WJ. A mouse model of argininosuccinic aciduria: biochemical characterization. Mol Genet Metab. 2003 Jan. 78(1):11-6. [Medline]. Saudubray JM, Rabier D. Biomarkers identified in inborn errors for lysine, arginine, and ornithine. J Nutr. 2007 Jun. 137(6 Suppl 2):1669S-1672S. [Medline]. Stadler S, Gempel K, Bieger I, et al. Detection of neonatal argininosuccinate lyase deficiency by serum tandem mass spectrometry. J Inherit Metab Dis. 2001 Jun. 24(3):370-8. [Medline]. Stephenne X, Najimi M, Sibille C, Nassogne MC, Smets F, Sokal EM. Sustained engraftment and tissue enzyme activity after liver cell transplantation for argininosuccinate lyase deficiency. Gastroenterology. 2006 Apr. 130(4):1317-23. [Medline]. Trevisson E, Salviati L, Baldoin MC, et al. Argininosuccinate lyase deficiency: mutational spectrum in Italian patients and identification of a novel ASL pseudogene. Hum Mutat. 2007 Feb 26. 28(7):694-702. [Medline]. Widhalm K, Koch S, Scheibenreiter S, et al. Long-term follow-up of 12 patients with the late-onset variant of argininosuccinic acid lyase deficiency: no impairment of intellectual and psychomotor development during therapy. Pediatrics. 1992 Jun. 89(6 Pt 2):1182-4. [Medline]. Hu L, Pandey AV, Balmer C, et al. Unstable argininosuccinate lyase in variant forms of the urea cycle disorder argininosuccinic aciduria. J Inherit Metab Dis. March 17 2015. Epub ahead of print:[Medline]. Premkumar MH, Sule G, Nagamani SC, et al. Argininosuccinate lyase in enterocytes protects from development of necrotizing enterocolitis. Am J Physiol Gastrointest Liver Physiol. August 2014. 307:G347-G354. [Medline]. Balmer C, Pandey AV, Ruefenacht V, et al. Mutations and polymorphisms in the human argininosuccinate lyase(ASL) gene. Hum Mutat. January 2014. 35:27-35. [Medline].